Galen G. Gordon is passionate about helping young people achieve their dreams through entrepreneurship. With that passion in mind, Galen teamed up with Kimberly Smith to found LAUNCHCincinnati. LAUNCH is a nonprofit dedicated to educating, mentoring and displaying positive examples of entrepreneurship. Connect with LAUNCHCincinnati on its website or facebook page. Read more about this great endeavor in this Soapbox article. If you’re interested in getting involved, visit this website. My first OTR experience came almost 15 years ago! I was living with my parents in Milford and drove down one morning in search of living options. I fell in love with the architecture and the opportunity for improvement in the area. It really peaked my passion for urban development and real estate! I believe it was love at first sight! I said then, I am going to live here one day! I realized it was a rough area at the time, but some people see problems as obstacles. I see them as opportunities! LAUNCHCincinnati is an organization promoting entrepreneurship to youth of Cincinnati’s urban core! My business partner, Kimberly Smith and I believe there continues to be a growing need to empower our youth to become innovative thinkers! Any young person between the ages of 12-18 can join our organization. Our city talks about YP’s and finding ways to keep our young talent in Cincinnati. LAUNCHCincinnati believes if we reach out to our young people as teenagers we can help them become our future business leaders! Our young people need to know that entrepreneurship is an option for creating a great future. True empowerment comes from financial independence! We are teaching young people how to build financial wealth. 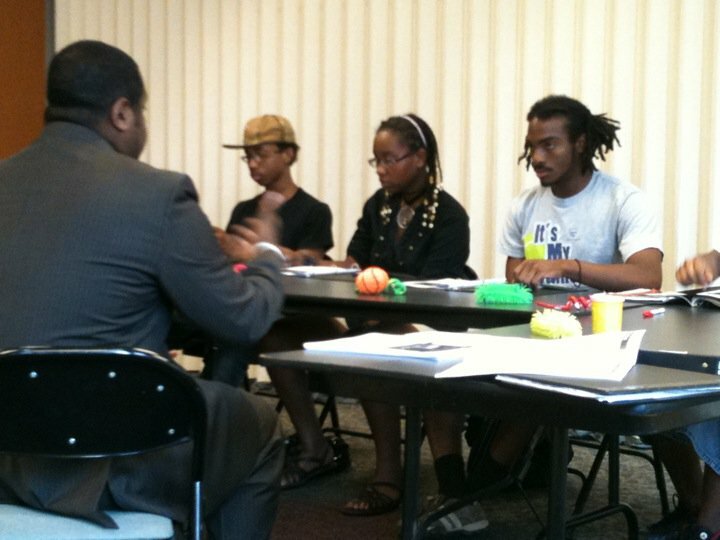 In turn, we believe they may become future business owners in our city! What influences led you to a life of entrepreneurship? My parents brought me up to think independently. Being one of 5 children, there wasnt a lot of money to for personal wants in my family. I can remember the shock at 12 years old when my mother told me my summer umpiring job would be funding the purchase of my school clothes! More importantly, I remember the excitement I felt when I was able to pick out what I wanted. My parents never questioned my choice of clothes or how much I was spending because I was using my own money. THAT was empowering! What advice do you have for other professionals interested in mentoring? How can others help LAUNCH meet its mission (ie volunteers, mentors, etc)? We are always looking for people interested in helping! 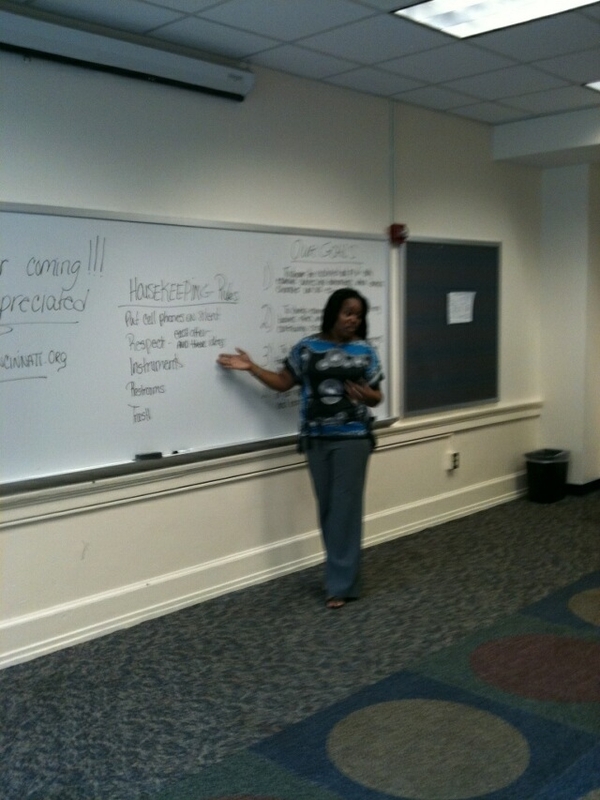 Our Young Entrepreneur Program has weekly ‘experts’ speaking on different topics of entrepreneurship. Our Success for Teens Series needs volunteers to help coordinate our community service efforts and help with our leadership skill initiatives. My best advice is….be present! Be available! Some young people experience unfortunate let downs from mentors who mean well, but don’t or can’t offer appropriate time. In a recent Soapbox Cincinnati article about LAUNCH, I read that curriculum for the Young Entrepreneur Program comes from the Warren Miller Freedom Foundation in Seattle. Could you tell us a little about the curriculum and how you connect with the WMFF? Each YE Program consists of 10 weekly classes. Each week, topics range from setting goals and selecting a business to networking and online marketing to managing employees and legal protection. Classes last approximately 2 hours each. We did a lot of research! It was important for us to find a curriculum that didn’t feel like more school! We needed the material to be simplified and we felt it was important to offer a program that didn’t take forever to complete. Our youth today have so many obligations and distractions. We want to keep their interest and the WMFF curriculum was the best fit for our needs. 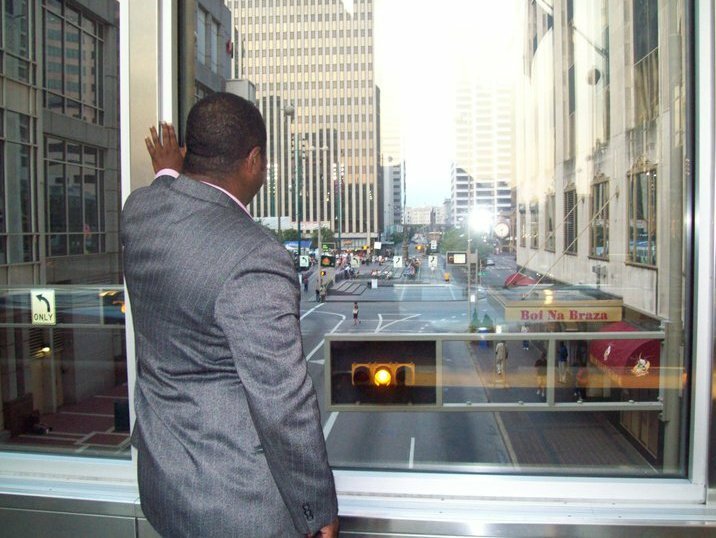 Galen G. Gordon, overlooking 5th St.
Where would you like LAUNCH to be in 5 years? What is your vision of a successful program? In 5 years, we want to have success stories working in our community. We would like to see LAUNCH expand into other cities. We believe we are creating a model of change for many revitalizing cities to duplicate! Imagine how much better our city will be when the young people who live in the urban core are able to become our success stories! When they are filling our empty store fronts and creating a better Cincinnati! Instead of this young person becoming a member of the street, he becomes a member of the chamber! Keep up the great work, Galen! Thanks!